White-fleshed peaches normally have more aroma and unique flavors. SweetCap™ is a white-fleshed peento or donut peach. The vast majority of peach varieties offered in the produce aisle are yellow fleshed peaches. This is predominantly because yellow fleshed varieties are more popular, but also because white-fleshed and other types of peaches are more difficult to raise, harvest, and ship to the consumer. There may be only one or two genes that control white flesh in peaches, so out of many thousands of seedlings that breeders may evaluate, only a few will have white flesh, and then only a miniscule number of those will have qualities that make them suitable for eating or growing. Most white fleshed peaches have unique flavors that differ from the majority of yellow fleshed peaches. Along with the unique flavors, they often have unique aromas that can be very attractive to the nose. Since smell and taste are closely tied together to give the total eating experience, white peaches can really give that “yummy” experience. Sometimes, other factors like clinginess to the stone, firmness or softness of the flesh, and general flesh quality are exhibited. Because some of these traits make harvesting properly and shipping difficult for commercial growers, one doesn’t often see white-fleshed peaches in the supermarket. A better place to find them are at farmer’s markets and fruit stands. 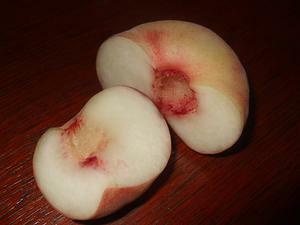 Most white fleshed peaches grow just like ordinary yellow flesh peaches for the backyard grower. In general, Grandpa thinks they may be slightly less hardy than most yellow fleshed varieties, but there are some quite hardy varieties that can be grown wherever yellow flesh peaches thrive. If you are in a very cold climate, like a cold Zone 5 or even colder zone 4, you may want to be careful in trying to grow them, though. You just aren’t in “peach country”. Like all peaches, make sure you thin the crop early after fruit set to get proper size. A peach every 8-12 inches per foot of limb is about right. Break up clusters to single fruits. If you have lots of spurs with peaches, try to leave the fruits on the more vigorous long growth from last year and remove as much of the fruits from the spurs as possible. Peaches and nectarines require from 10-30 leaves per fruit to produce big, quality fruits..
All peach and nectarine trees need proper trimming in the early to late spring in order to maintain vigor. Make sure to supply adequate nitrogen and other fertilizer. You should be aiming to re-grow at least 12-24 inches of annual new growth each year for a healthy tree. If you are getting 36 inches or more than you may either be over-pruning or over-fertilizing. Expect more growth in the South than in the North. White fleshed peaches are as susceptible as yellow fleshed ones to brown rot, other fungal diseases, and insect damage. Maintain a good spray program to ensure good quality fruit. Grandpa offers a limited amount of white-fleshed peaches, including Erly-Red-Fre, Flamin’Fury® PF- 8Ball White, Raritan Rose, and Stellar® Blushingstar®. Other white fleshed offerings in the stone fruit line are the peento or donut peaches like Saturn and SweetCap and the nectarine Artic Glo™. Three years ago I purchased an Arctic Glo nectarine from your nursery, and I must say thank you! It is by far the most outstanding nectarine I ever tasted. It is amazing and in my opinion a must have, and by far the best tree I have. Old Mixon Free is a great heirloom cultivar peach that is super hard to find. It will blow away most other whites. Seek it out!